The United States were out maneuvered by the Iranians again. According to the P5+1 Obama/Kerry capitulation, err— nuclear deal, the rogue regime was to keep no more than 130 metric tonnes of heavy water (which is used to manufacture weapons-grade plutonium). But the Iranians kept producing the heavy water and were over the cap in February and November. Note: Heavy water has nothing to do with Rosie O’Donnell’s perspiration. 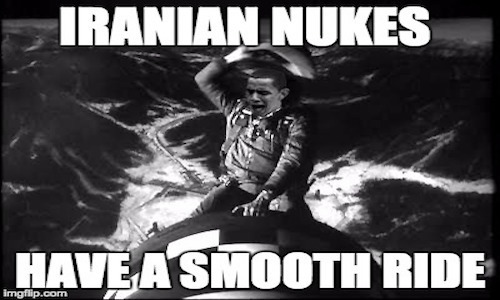 Iranian heavy water production overages put Obama’s Iranian deal (his only foreign policy legacy besides screwing Israel) between a rock and a hard place. Either the Obama administration could find someone to purchase the excess heavy water (which would allow Iran to make a profit off of violating the deal) or expressing that Iran was in noncompliance of the deal, which would put Obama’s legacy in danger. David Albright, whose Institute of Science and International Security often briefs U.S. lawmakers on Iran’s nuclear program, says the shipment could be enriched to enough weapons-grade uranium for more than 10 simple nuclear bombs, “depending on the efficiency of the enrichment process and the design of the nuclear weapon.” The swap is in compensation for the 70 metric tons (77 tons) of heavy water exported by Iran to the United States, Russia and Oman since the nuclear agreement went into effect. There are no diplomatic or technical reasons Iran needs to sell excess heavy water to avoid violating the deal. The Iranians could stop producing heavy water or if they find they are over, they could dump the excess in a river, since it’s just water (with a different kind of hydrogen–if you want to understand the difference ask Michio Kaku or someone, I never took chemistry or physics) . Obama officials have tried to put lipstick on the Iranian over-production pig suggesting that Iranian overage is a good thing because there are shortages in the global market. Of course like so much coming out if this administration that’s not true. There are no shortages, and additionally the Iranian product may flood the market and create actual shortages by knee-capping the existing legitimate suppliers. Thankfully there is only two weeks left to this disastrous administration.